Recent events on college campuses have recalled to my inward eye one of the great happenings in my own lifetime. It took place at Harvard back in the days when giants walked the earth and Harvard Yard. Joseph Schumpeter, Harvard’s brilliant economist and social prophet, was to debate Paul Sweezy on “The Future of Capitalism.” Wassily Leontief was in the chair as the moderator and the Littauer Auditorium could not accommodate the packed house…. Opposed to the foxy Merlin was young Sir Galahad. Son of an executive of J.P. Morgan’s bank,3Paul Sweezy was the best that Exeter and Harvard can produce….Sweezy had early established himself as among the most promising economists of his generation. But tiring of the conventional wisdom of his age, and spurred on by the events of the Great Depression, Sweezy became one of America’s few Marxists…. Unfairly, the gods had given Paul Sweezy, along with a brilliant mind, a beautiful face and wit. With what William Buckley would desperately wish to see in his mirror, Sweezy faced the world. If lightning had struck him that night, people would truly have said that he had incurred the envy of the gods. 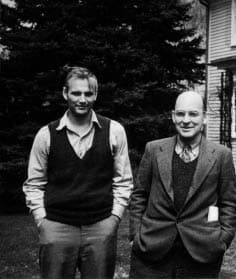 Sweezy and Schumpeter soon became close personal friends—part of a social as well as intellectual community in Cambridge at the time. 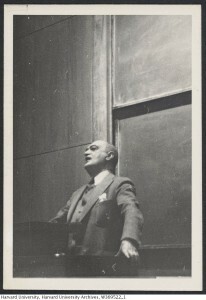 For two years in the mid-1930s, Sweezy was Schumpeter’s assistant in the latter’s introductory graduate economics theory course. Their relationship, however, was more personal than intellectual. As Sweezy explained in a letter to his friend, the economist Sol Adler (September 29, 1987), “As to my relationship with Joe, I don’t know if there is much of real interest. In an intellectual sense, there wasn’t much to it. I was curious about and interested in his theories but I think hardly at all influenced by them. We never discussed such matters at any length. The personal relationship was something else but not at all easily described or classified. Perhaps I was something of an ersatz son—incidentally, if I was his Harvard ersatz son, Taussig was his ersatz Harvard father—and we were certainly very fond of each other.”6 Their close connection lasted until Sweezy joined the army in 1942—the year that Sweezy’s The Theory of Capitalist Development and Schumpeter’s Capitalism, Socialism, and Democracy were published. In contrast, Sweezy’s account of Marxian political economy in The Theory of Capitalist Development argues that accumulation, as opposed to the entrepreneur, is the prime mover of the economy, and that the logic of the system runs from accumulation to innovation, and not the other way around. In Marx’s reproductive schemes at the end of volume 2 of Capital, a model of the economy, referred to as “simple reproduction” is presented, from which all development is abstracted. All the institutional characteristics of capitalism remain, but the assumption is made that all surplus is consumed through increased capitalist consumption, rather than invested in the form of new net investment (which does not exclude replacement investment out of depreciation funds). This creates an economy that simply reproduces itself at the same level, year in and year out. Yet Marx’s whole point is that this is, in reality, impossible for any length of time in a capitalist system, whose credo is “Accumulate, accumulate! That is Moses and the prophets.”9 Hence, he quickly turns from the abstract model of simple reproduction, to the more realistic model of “expanded reproduction,” in which accumulation takes place. As Sweezy summed up the difference between the Marxian and Schumpeterian systems in his article “Professor Schumpeter’s Theory of Innovation” (published in 1943 in honor of Schumpeter’s sixtieth birthday), for Schumpeter: “Profits result from the innovating process, and hence accumulation is a derivative phenomenon. The alternative view maintains that profits exist in a society with a capitalist class structure even in the absence of innovation. From this standpoint, the form of the profit-making process itself produces the pressure to accumulate, and accumulation generates innovation as a means of preserving the profit-making mechanism and the class structure on which it rests.”10 Rather than a minor issue, this constituted the principal difference between Marxian (and classical) and orthodox or neoclassical economics. Schumpeter’s notion of economic development, arising from the individual entrepreneur, had a certain claim to plausibility in the nineteenth-century era of free competition. But, with the rise of the giant corporation and monopoly capitalism, the ideas of both free competition and of the entrepreneur as the leading force in economic change were obviously less and less relevant. Schumpeter was the first mainstream (non-radical) economist to address theoretically the rise of a new stage of concentrated capital, in his 1928 essay, “The Instability of Capitalism,” directed at what he called “trustified capitalism”—under which firms no longer acted as competitors but rather, as what he termed “corespectors” (a reference to oligopolistic markets). Recognizing the difficulties that this presented for his analysis of the entrepreneur, he took the big step in this article of placing the innovative function, no longer in the hands of the entrepreneur, but in the big corporation, and seeing it as routinized by an army of specialists, if without the entrepreneurial dynamism of before.11 But this change in his model was little noticed in economics as a whole—until 1942, when he advanced it again in Capitalism, Socialism, and Democracy, in the context of a conflict with New Deal economics. The key economic argument of Capitalism, Socialism, and Democracy was developed in Part II, entitled “Can Capitalism Survive?” (Schumpeter’s famous answer was: “No. I do not think it can.”) Here he was concerned with refuting New Deal criticisms of capitalism for its monopolistic and stagnationist tendencies. Although Schumpeter did not deny—in the great stagnation debate of the late 1930s and early 1940s brought on by the Great Depression—that the system was, in fact, stagnating, he insisted that the causes were more sociological than economic. Paul Sweezy (on left) with literary historian and MR benefactor F.O. Matthiessen in the 1940s. Monthly Review Archives. All of this forms the background against which we can view Sweezy’s “Laws of Capitalism” and the entire Sweezy-Schumpeter debate. Sweezy’s detailed outline of his talk is printed below, together with commentary that I have provided to assist the reader. Sweezy’s argument focused principally on the issue of the laws of motion of capitalism, that is, what constituted capitalism’s prime mover. For Schumpeter, as we have seen, it was the entrepreneur. For Sweezy, it was accumulation: a process that transcended the individual capitalist. For Schumpeter, all the specific economic characteristics of capitalism—profits, savings and investment, interest, the business cycle, even the capitalist, along with economic development—derived from the entrepreneurial function. For Sweezy, in contrast, the main institutional characteristics of capitalism should be seen as coming first and generating an accumulation dynamic (M-C-M′), to which innovation (Schumpeter’s creative destruction and Marx’s revolutionization of the means of production) was a response. These different conceptions resulted in radically different theories of capitalism and crisis. In Schumpeter’s case, the business cycle was principally related to cycles of innovation; for Sweezy, it had principally to do with cycles of accumulation. It followed that for Schumpeter, crises were not essentially about failures in the accumulation (savings-and-investment) process, which tended to equilibrate on its own. While for Sweezy, it was precisely the accumulation process that was fundamentally at issue in any crisis. Finally, there was the question of monopoly, stagnation, and the transition from capitalism to socialism. Schumpeter had argued in 1928 that “trustified capitalism” generated greater economic stability by attenuating creative destruction and hence crises (through a process of the automatization of innovation), while at the same time undermining the sociological foundations of capitalism by displacing the individual entrepreneur. Sweezy, in the debate, invited Schumpeter, in the aftermath of the Great Depression, to rethink the notion that monopoly capitalism was a force for economic stability. The patient is capitalism. What is to be his fate? Our speakers are in fact agreed that the patient is inevitably dying. But the bases of their diagnoses could not be more different. On the one hand there is Sweezy, who utilizes the analysis of Marx and of Lenin to deduce that the patient is dying of a malignant cancer. Absolutely no operation can help. The end is foreordained. On the other hand, there is Schumpeter. He, too, and rather cheerfully, admits that the patient is dying. (His sweetheart already died in 1914 and his bank of tears has long since run dry.) But to Schumpeter, the patient is dying of a psychosomatic ailment. Not cancer but neurosis is his complaint. Filled with self-hate, he has lost the will to live. Sweezy, in his later years, had no inclination to romanticize the debate with Schumpeter. Rather, what significance it had for him was simply as a part of a much larger debate on stagnation that took place from the late 1930s into the 1940s—and that had all the signs of “becoming one of the classic controversies in the history of economic thought.” The whole question of the stagnation of capital accumulation, however, was to be buried prematurely, due to the economic stimulus offered by the Second World War, followed by the relative prosperity in the early postwar years.26 Ironically, when stagnation eventually did reemerge in the 1970s and ’80s, the Schumpeterian supply-side view was to triumph over what remained of Keynesian demand-side economics. In line with this, I would argue that today, in a time of deepening stagnation, a resumption of the debate over “The Laws of Capitalism”—focusing on capitalism’s tendency to overaccumulation and stagnation—is a necessity, if we are to develop a realistic assessment of the present as history. For this, if for no other reason, the Sweezy-Schumpeter debate deserves our close attention. ii Here the point was that, in using the term “laws,” both Sweezy and Schumpeter were agreed that these should be viewed, in the manner of Marx, as historical “tendencies” and in a historically specific context. Thus, it was common for Schumpeter to raise the issue of “long-run tendencies” and their relation to “causes inherent in the capitalist mechanism.” See Schumpeter, Capitalism, Socialism, and Democracy (hereafter, CSD), 70.
iii Schumpeter, CSD, 82-83. This passage was referred to in Sweezy’s outline and was marked in his copy of the book. iv In the sentence following the passage that Sweezy quoted from Schumpeter’s CSD, Schumpeter had gone on to say: “The fundamental impulse that sets and keeps the capitalist engine in motion comes from the new consumers’ goods, the new methods of production or transportation, the new markets, the new forms of industrial organization that capitalist enterprise creates” (emphasis added by Sweezy in his copy of Schumpeter’s book). Schumpeter’s argument here is that entrepreneurial innovation is the prime mover of capitalism: the very thing that Sweezy seeks to dispute. 4. But there is an important disagreement about what sets this process in motion. Schumpeter’s theory, as I understand it, is that the motor force comes from the “entrepreneur.”iv The entrepreneur is an innovator, a recognizable sociological type (“leader” type) which comes from all strata of society. The type presumably exists in other societies, but it is only in capitalism that its representatives predominantly devote themselves to the economic sphere. v Sweezy indicates here that, in the Schumpeterian system, not only economic development is derived from the leadership of the entrepreneur in carrying out innovation (new methods and combinations of production) but that all the institutional characteristics of capitalism are derived from this too. vi Here Sweezy refers to the accumulation process in Marx’s terms (see Capital, vol. 1, Part 2: “The Transformation of Money into Capital”), as a process of M[oney]-C[ommodity]-M[oney]′—with the ′ standing for the Δm or surplus value gained at the end of the exchange. Capital is thus defined as self-expanding value in which M′ in one period of production gives rise to M′′ in the next, and M′′′ in the period after that, and so on—with no end to the process. For Sweezy “M-C-M′ is the heartbeat that pumps the system’s monetary lifeblood through its arteries and veins. In the one case as in the other, the health of the system depends on the proper functioning of the heart: irregularity or weakness causes systemic illness and in extreme cases threatens life itself.” Magdoff and Sweezy, Stagnation and the Financial Crisis, 158.
vii Sweezy’s argument here suggests that in Schumpeter’s supply-side approach, which focuses on entrepreneurial innovation as the primary cause of business cycle fluctuations, there is an implicit adoption of Say’s Law (supply creates its own demand), whereby the system automatically equilibrates (at least in the long run) with respect to savings and investment, with no contradictions arising. In this way, Schumpeter’s view stands opposed to that of both Marx and Keynes. Schumpeter argued that Keynes’s (and Marx’s) critique of Say’s Law was exaggerated, and really only related to a “special case.” See Schumpeter, History of Economic Analysis, 624. Indeed, Schumpeter’s main objection to Keynes was that he had provided “a doctrine that may not actually say but can easily be made to say both that ‘who tries to save destroys real capital’ and that, via saving, ‘the unequal distribution of income is the ultimate cause of unemployment.’ This is what the Keynesian Revolution amounts to.” Joseph A. Schumpeter, Ten Great Economists (New York: Oxford University Press, 1951), 290.
viii This argument is not only the main conclusion of the Keynesian Revolution, but is also presented here by Sweezy in a way that is integrated with the Marxian analysis of accumulation, generating a theory of overaccumulation. This constituted a direct challenge to Schumpeter’s point of view, since he explicitly downplayed “disturbances in the savings-investment process,” which he claimed it was “the fashion [in economics] to exaggerate.” Schumpeter, CSD, 120.
ix Here Sweezy seems to be saying that there is no reason to suppose that the business cycle shows some mathematical uniformity between the boom and slump phases of the cycle, but that a great deal of variation is possible—precisely because accumulation (or the savings-and-investment process) is subject to all sorts of fits and starts. x For Sweezy, Schumpeter’s 1928 essay, “The Instability of Capitalism,” was crucial, since it raised the issue of the shift from competitive to monopoly (referred to by Schumpeter as “trustified”) capitalism, the relation of this to economic stability, and the question of the transition from capitalism to socialism. Schumpeter had concluded in this essay that trustified capitalism, in automatitizing innovation within the large corporation, had produced “the result that the only fundamental [economic] cause of instability inherent to the capitalist system is losing its importance as time goes on, and may even be expected to disappear.” In other words, the effect of creative destruction in generating big business cycle swings that destabilized the system was ebbing. Schumpeter, Essays, 71. At the same time, Schumpeter argued that the sociological foundations of capitalism were being removed, as a result of the disappearance of the entrepreneur as a social type, pointing in the direction of socialism. Although Schumpeter took up this problem again in 1942, in CSD, the economic part of the argument was not, in Sweezy’s view, developed any further, with Schumpeter failing to address consistently and coherently the relation between growing monopolization and the increasing economic instability of capitalism. Sweezy’s final point in his talk was therefore directed at getting Schumpeter to respond to the issues of monopoly capitalism, structural economic crisis, and the instability of the system as a whole. These issues were, of course, central to Sweezy’s own work, to be developed most fully in Paul M. Sweezy and Paul A. Baran, Monopoly Capital (New York: Monthly Review Press, 1966). ↩ In a January 16, 1984, letter to Schumpeter biographer Robert Loring Allen on the 1946 debate, and on other occasions in the 1980s and ‘90s, Sweezy indicated that he did not have a good recollection of the detailed intellectual content of the debate, though he had vivid memories of the event as a whole, which was, in his words, a “good-natured occasion, which everyone seemed to enjoy.” It seems reasonable to assume from this that Sweezy had forgotten all about his manuscript left in his 1942 edition of Schumpeter’s book. ↩ Robert Loring Allen, Opening Doors: The Life and Work of Joseph Schumpeter (New Brunswick, New Jersey: Transaction Publishers, 1991), 170. The information on the origins of the debate was taken by Allen from correspondence in the Schumpeter papers in the Harvard University Archive. ↩ Samuelson was mistaken on this point. Sweezy’s father was not an officer in Morgan’s bank but a vice president in George F. Baker’s bank, the old First National Bank of New York—one of the predecessors of City Bank. Baker was a close ally of Morgan and one of the financial giants of the early twentieth century. On Everett B. Sweezy (Paul’s father) see Sheridan A. Logan, George F. Baker and His Bank (St. Joseph, Mo. : S.A. Logan, 1981), 376-79. ↩ Paul A. Samuelson, Collected Scientific Papers, vol. 3 (Cambridge, Massachusetts: MIT Press, 1972), 710. ↩ Joseph A. Schumpeter, Essays (Cambridge: Addison-Wesley, 1951), 160. ↩ Paul M. Sweezy (Larchmont) to Sol Adler (Beijing), September 29, 1987. ↩ Paul M. Sweezy, The Theory of Capitalist Development (New York: Monthly Review Press, 1970), ix. ↩ Joseph A. Schumpeter, The Theory of Economic Development (New York: Oxford University Press, 1961); Paul M. Sweezy, The Present as History (New York: Monthly Review Press, 1953), 267-73; John Bellamy Foster, “Theories of Capitalist Transformation: Critical Notes on the Comparison of Marx and Schumpeter,” Quarterly Journal of Economics 98, no. 2 (May 1983): 327-31. ↩ Karl Marx, Capital, vol. 1 (London: Penguin, 1976), 742, and Marx, Capital, vol. 2 (London: Penguin, 1978), 468-599. ↩ Sweezy, The Present as History, 282. ↩ Schumpeter, Essays, 47-72; Paul M. Sweezy, Modern Capitalism and Other Essays (New York: Monthly Review Press, 1972), 32. ↩ Joseph A. Schumpeter, Business Cycles, vol. 2 (New York: McGraw Hill, 1939), 1034. What is known in the economic and sociological literature as the “Schumpeter Thesis,” according to which large firms are more innovative than smaller, more competitive ones, is a gross distortion of Schumpeter’s own argument both with respect to its economic specifics and even more so when taking into account his entire analysis (both economic and sociological) of the effects of the decline of the entrepreneur. For an excellent treatment see Anne Mayhew, “Schumpeterian Capitalism versus the ‘Schumpeterian Thesis,’” Journal of Economic Issues 14, no. 2 (June 1980): 583-92. ↩ Joseph A. Schumpeter, Capitalism, Socialism, and Democracy (New York: Harper and Row, 1942), 134. On Schumpeter’s entire theory of the rise and decline of capitalism see John Bellamy Foster, “The Political Economy of Joseph Schumpeter: A Theory of Capitalist Development and Decline,” Studies in Political Economy 15 (Fall 1984): 5-42. ↩ Schumpeter, Capitalism, Socialism, and Democracy, 111-20; Alvin H. Hansen, Full Recovery or Stagnation? (New York: W.W. Norton, 1938), and Fiscal Policy and Business Cycles (New York: W.W. Norton, 1941); and William E. Stoneman, A History of the Economic Analysis of the Great Depression in America (New York: Garland Publishing, 1979), 151-66. In an April 10, 1991, letter to Schumpeter biographer Wolfgang Stolper, who had asked Sweezy for comments on the manuscript of his biography, Sweezy wrote: “Perhaps my biggest difference with you (and Joe) is touched on in various passages….You both, it seems to me, identify innovations with profitable investment opportunities and draw the conclusion that since the supply of innovations is theoretically inexhaustible the same also holds for profitable investment opportunities.” Paul M. Sweezy to Wolfgang Stolper, April 10, 1991; Wolfgang Stolper, Joseph A. Schumpeter: The Public Life of a Private Man (Princeton: Princeton University Press, 1994). ↩ Schumpeter, Business Cycles, vol. 2, 1036-37, and Capitalism, Socialism, and Democracy, 145-55; Harry Magdoff and Paul M. Sweezy, Stagnation and the Financial Explosion (New York: Monthly Review Press, 1987), 30-32. ↩ On Schumpeter’s view of Sweezy’s book see Joseph A. Schumpeter, History of Economic Analysis (New York: Oxford University Press, 1954), 392, 884-85, and Richard Swedberg, Schumpeter: A Biography (Princeton, New Jersey: Princeton University Press, 1991), 140. ↩ See John Bellamy Foster, “The Commitment of an Intellectual: Paul M. Sweezy (1910-2004),” Monthly Review 56, no. 5 (October 2004): 14-15. ↩ On Schumpeter’s enormous reticence to speak on his own theoretical contributions, even when directly requested to do so, see Paul M. Sweezy, “Introduction,” in Joseph A. Schumpeter, Imperialism and Social Classes (New York: Augustus M. Kelley, 1951), viii-ix. ↩ Eduard März, Joseph Schumpeter: Scholar, Teacher, and Politician (New Haven: Yale University Press, 1991), 165. März does not specifically say on what occasion the debate he witnessed occurred. But he arrived at Harvard in 1941, and Sweezy was in the OSS in Europe from 1942 to fall 1945—so it is almost certain these remarks relate to the winter term 1946-1947 debate in the Littauer Auditorium. His comments, moreover, match those of other reports on the debate. ↩ Allen, Opening Doors, 171. ↩ Schumpeter, Capitalism, Socialism, and Democracy, 380-98. ↩ Leontief quoted in Samuelson, Collected Scientific Papers, 710. ↩ Samuelson, Collected Scientific Papers, vol. 3, 710. ↩ Sweezy to Allen, January 16, 1984. That this was all in fun, especially with respect to the parties most concerned, is evident in the fact that Elizabeth Boody Schumpeter and Sweezy were also good friends, and Sweezy had played a role “witting and unwitting,” as he later said, in helping her with her plans to become more intimately acquainted with Schumpeter. When he married Elizabeth in 1937, Schumpeter wrote to Sweezy good-naturedly that (as Sweezy later recalled) “it was all my fault, damn me [laughter]. I had to disclaim all responsibility. I certainly didn’t do anything to promote it willingly.” Sweezy, Interview, Columbia University Oral History Project, December 10, 1986, session 3, 81-82. Sweezy subsequently assisted Elizabeth Schumpeter in her editing of her husband’s posthumous History of Economic Analysis. ↩ Magdoff and Sweezy, Stagnation and the Financial Explosion, 332. ↩ See Magdoff and Sweezy, Stagnation and the Financial Explosion, 7-10, 29-38, 43-45.